Massachusetts’ Rashaan Holloway hurt his thumb in practice last Wednesday and will reportedly be out 4-6 weeks. Matt McCall told ESPN that he’s “hopeful” the big man will be back for the opener. 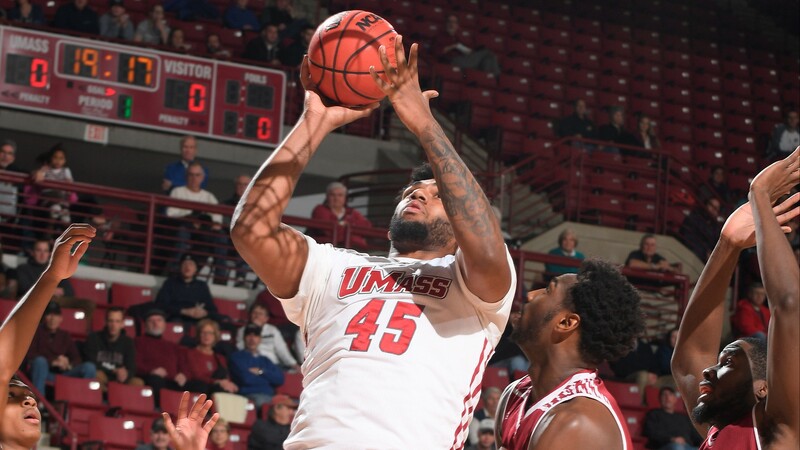 UMass big man Rashaan Holloway broke his thumb in practice on Wed., Matt McCall told ESPN. Likely out 4-6 weeks, hopeful back for opener. Should the Minutemen be without their best player to start the season, they’ll have some serious depth issues. A heart condition ending Jaylen Brantley’s career added depth issues last week. Massachusetts is down to just 8 scholarship players, and walk-on Rayshawn Miller’s expected to get his fair share of playing time as well. Even if Holloway isn’t back for the season opener, he should be on the court before Massachusetts’ schedule gets too difficult. Massachusetts has a tricky road game against Harvard on November 12th. Before the Barclays Classic on November 23rd, UMass will face beatable opponents at home: UMass Lowell, Niagara, and Western Carolina. Before the Minutemen dual it out with Minnesota in New York, they’ll have some hurtles to jump. New guys will be getting tons of playing time, and if Holloway’s not around, Massachusetts could struggle at home early on. Hopefully, his recovery goes quickly, as Matt McCall’s going to need his star big man more than ever. Follow us on Twitter, like us on Facebook, and check out our forum for more Massachusetts content.